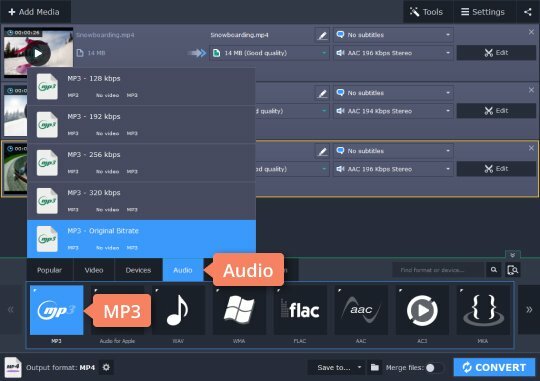 Looking for an MP4-to-MP3 converter for Mac? MP4 (MPEG-4) is a very popular video format that is today used almost everywhere, from older mobile phones to the latest Blu-ray players. The format is so flexible that it can handle a large 4K video file as easily as a low-res mobile video. MP4 is also widely used on the internet so, if you download a music video or a TV series, you are most likely to find it in MP4 format. And what if you liked a song from the video so much that you wanted to listen to it on your portable player or mobile phone all day long? In this case, it’s best to extract the audio file and save it in MP3 – one of the most popular audio formats as well. 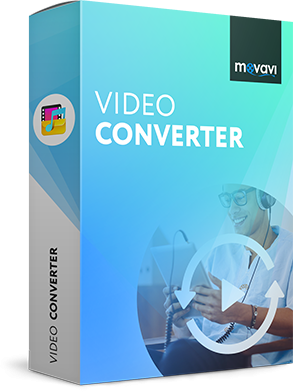 Converting MP4 to MP3 on Mac is extremely easy with Movavi Video Converter. This powerful software supports almost all known media formats. 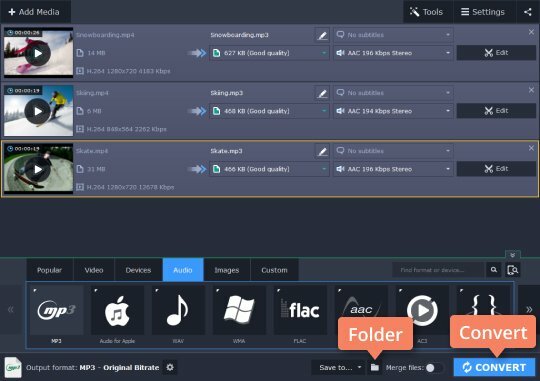 Take any music video or TV show episode and easily turn it into an audio track. And with the help of batch conversion, you’ll be able to export multiple tracks at one time. 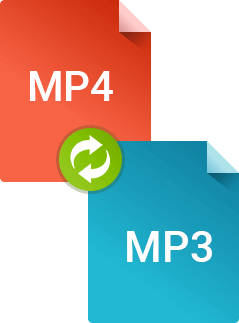 To learn how to convert MP4 to MP3, read our step-by-step instructions below. Download Movavi’s MP4-to-MP3 converter for Mac and try it for free! After you’ve downloaded Movavi Video Converter, double-click the .dmg file to start the installation process. Follow the instructions and wait until the installation is completed. When all the preparation is done, just run the program. 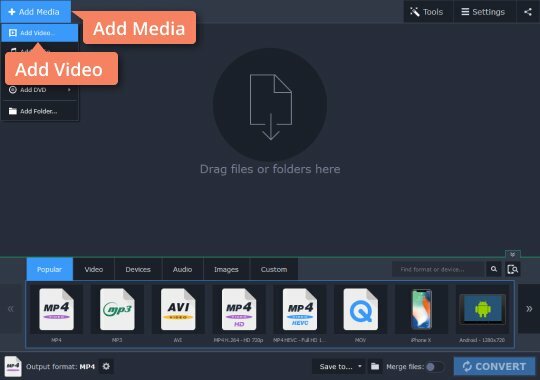 Click Add Media and then Add Video to open the files you want to convert. Or simply drag and drop files from their folder into the program window. In the Audio tab, find MP3 and select one of the presets. To get the best possible quality, choose either Original Bitrate or 320 kbps. If you ever need to do things the other way round and convert MP3 to MP4, simply go to the Video tab and select one of the MP4 presets. Specify the target folder by clicking the Folder icon, otherwise the files will be saved to the default Movavi Library folder. Click Convert to start the conversion. After the process is complete, the folder with your music files will open automatically. Now you know how to easily convert MP4 to MP3 on Mac with Movavi Video Converter! One of the best ways to record from your screen in HD. 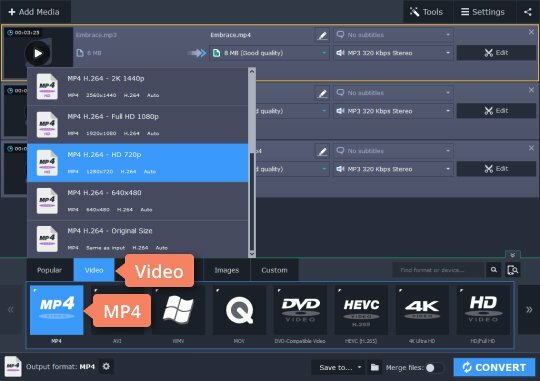 Make video footage of any application, record online streaming video, webinars, even Skype calls, and save clips in all popular formats.